We're in the middle of a heavy run of fixtures right now, which is what happens when you're competing on three fronts. Since coming out of the last international break, Arsenal's fixture list placed matches on Saturday, Thursday, Sunday, Wednesday, Monday, Thursday, Sunday, a list we are currently halfway through. Arsenal's regulars will have had a good amount of rest between last week's trip to Stamford Bridge and this week's Monday night home game against West Brom. From there, they'll travel to Belarus on Thursday before a trip to Brighton at noon on Sunday (that's at something like negative 2 a.m. in New York, FYI.) That takes us into another international break. Arsenal have climbed from 16th in the table to 12th since their loss at Anfield, but they are only three points back of Chelsea for third place.While the table has made for some bleak reading so far this year, I've been encouraged by other results. Arsenal were in with a shout to take a win from Stamford Bridge for the first time since the Mesozoic Era; that's enough to convince me that Arsenal are still in contention to be a top four club, regardless of what the media's #narrative will try to tell you. But, to finish in the top four, you have to win the games you are supposed to win. West Brom at home is one of those fixtures, where nothing less than three points will suffice. Jack Wilshere completed 90 for the first time since... well, maybe the later part of the Mesozoic Era? Or the early part of the Cenozoic? It's been a while. That's really it for the "good news," though. Calum Chambers came off against Doncaster with a hip injury that will keep him out for a week or two. Elsewhere, from the weekend, Danny Welbeck hurt his groin against Chelsea. Arsène Wenger has said, "his target is Watford," which means Arsenal will be without him through the next international break and it appears England will be without him as well. Theo Walcott has some concerns over a knee injury, but was not likely to start the league fixture anyway. Mesut Özil is back in full training from his knee problem and should be ready to feature by Monday. A lot of doubts in West Brom's injury list, as they have no players ruled completely out, but four who about 50/50. Jake Livermore could return after he was given an extended break by Tony Pulis after the last international break, with Pulis saying, "physically he is fine but mentally, he just feels a little bit tired." It's been a difficult few years for Livermore, who tested positive for cocaine in 2015, which he had begun using to cope after his newborn son died during birth the day after he started for Hull City in their FA Cup Final loss. Oliver Burke, Nacer Chadli and Chris Brunt are all doubts for this match, though Gareth McAuley has returned to West Brom's XI. Kieran Gibbs will be given a start against his former club in this one, while Gareth Barry is expected to break the Premier League record for appearances when he starts in this one. Predicted XI: Foster, Dawson, McAuley, Evans, Gibbs, Krychowiak, Barry, Phillips, Rodriguez, Livermore, Rondón. Arsenal have responded decently well after the international break, following that 4-0 thumping at Anfield. Since then, the Gunners have racked up a 3-0 win over Bournemouth, a 3-1 win over Köln, a 0-0 draw at Chelsea, and a 1-0 win over Doncaster in the League Cup. There have been positives in the league fixtures, but the midweek cup ties featuring heavy squad rotation have left quite a bit to be desired, even though they both ended in victories. It feels like Arsenal are currently doing just enough to keep their heads above water, even though their performance at Stamford Bridge was better than our admittedly low expectations. On the bright side, since shipping four at Anfield, the only goal Arsenal have conceded was David Ospina's first half adventure against Köln. 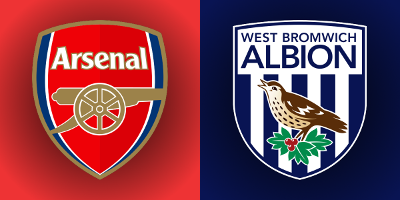 In the league, West Bromwich Albion are ahead of Arsenal in the table by two positions and a single point. Their League Cup campaign ended on Wednesday night at home, at the hands of Manchester City, but they did open their Premier League schedule with two straight victories, over Bournemouth and Burnley. The Baggies are winless since then, however, with draws against Stoke and West Ham as well as a loss to Brighton; that was the Seagulls' first top flight win since their last relegation in 1983. Both sides split the two league meetings between them last season, with both clubs winning at home. The sides met at the Emirates on Boxing Day and Arsenal left it late before winning 1-0. Olivier Giroud, making his first league start of the season, nodded a Mesut Özil cross past Ben Foster in the 86th minute to give the Gunners a very difficult three points. Ben Foster made 10 saves in the loss. The reverse fixture at the Hawthorns was one of Arsenal's low points of the season (they proceeded to get lower at Crystal Palace, however.) Arsenal seemed completely unprepared for how West Brom came to play, despite the fact that they've been facing Tony Pulis for years across a variety of teams. You'll recall that this was the game where the Wenger Out airplane banner was followed by the Wenger In airplane banner. Craig Dawson scored twice from corners as the Baggies won 3-1. It was Arsenal's fourth defeat in five league games. Arsenal have won seven straight at home against West Brom, dating back to September of 2010, when Manuel Almunia injured himself saving a penalty, stayed in the game anyway, then conceded three goals. The referee is West Yorkshire-based Robert Madley. Arsenal have already seen Madley once so far this season, for their Community Shield win over Chelsea. On that day, Madley showed a red card to Pedro in the 80th minute. Madley has already shown four red cards in five matches so far this season, two more than any other Select Group officials. West Brom have also already seen Madley once this season, for their season opening 1-0 win over Bournemouth at the Hawthorns. However, West Brom did not see Madley for a single match at all last season. Prior to the season opener, Madley had not worked a West Brom match since a 1-1 draw with Liverpool on the final day of the 2015/16 season. John Painting is a contributing writer to the Modern Gooner and a four-act play. You can follow him on Twitter @zorrocat for the dramatic conclusion.